Today marks another edition to the Secure Sense Crew Interview, a little q&a, so you can get to know the phenomenal technical and sales teams we have here! 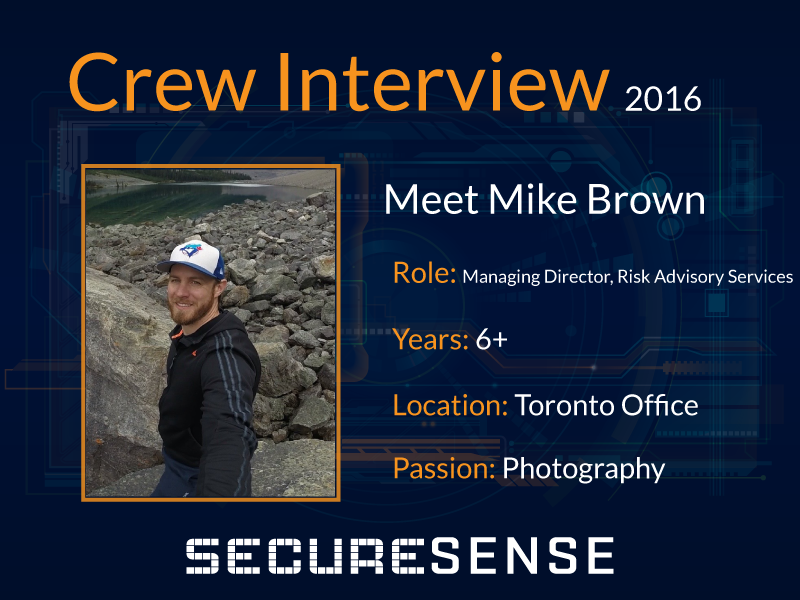 For our fourth interview, to show off our crew, we present to you … Mike Brown. Tea, my ancestry dictates it, though I’m nowhere near the 4-5 cups a day my folks drink. I’m one of Secure Sense’s lead consultants working on a variety of assessments, reviews, audits and various other customized engagements for our clients. In addition, I also work closely with our sales team on business development as part of the pre-sales process. Finally, I’m an outfielder for our softball team “Pitch Don’t Kill My Vibe” and reigning company 10-pin bowling champ (still awaiting my trophy..ahem). I was actually a burgeoning Political Science major in the late 90s when information technology really took off. I dropped out of university 2 years in and got a job as a cable guy for a small communications firm. There I learned the ins and outs of networking from a hardware (Layer 1) perspective, wiring up phone systems, computer networks, and speakers. I took a liking to the networking side of things so I enrolled in a College program focused on Cisco CCNA fundamentals and the rest is history. I’m not quite sure, I think I’m pretty well-rounded with regards to my skills, experience, and knowledge. You can’t really say that about a lot of people and I’d probably credit some of that to my research skills. Whether it’s online research or knowing the right person to ask from an expertise perspective, I’ve always been good at asking the right questions. I definitely think that helps me when I’m performing tabletop exercises and interviewing different IT personnel. The right questions yield the right answers which overall leads to development of valuable findings and recommendations. Smartphones have blown up (both literally and figuratively) since I started in tech. I remember having a Motorola RAZR in 2004 and thinking “this thing is the bomb!” with its 14MB of memory and slick appearance but not much use besides phone calls. Now we have touchscreen smartphones that we can use for pretty much anything with the proliferation of mobile apps. It’s pretty remarkable and kinda scary the reliance we have on these little devices now. User Awareness, organizations have embraced technology as a necessary part of conducting their business but most don’t understand the risks that reside in their staff. I think it’s really important that companies don’t just focus on pure technology solutions to solve Information Security issues. Test your staff, challenge their knowledge regularly and encourage them to work towards understanding why Information Security is so important to your organization. The people, that’s the safe answer, right? Yeah, they’re alright 😉 but if I’m being completely honest it’s gotta be the hours. I’m not a morning person and working here has allowed me to adjust my schedule which definitely makes me a more effective member of the team. That’s not to say I never get up early, cause I’m all about working with our customers and delivering projects, but it’s a really nice part of working here. The people are great, though. I like going off the beaten path and really exploring so you’d probably find me in some obscure country learning about their culture and history. Asia is great for that cause it’s massive geographically, extremely diverse and relatively affordable to travel around. Visually, it’s also stunning and that’s great considering I’m really into photography. If you haven’t been it’s well worth suffering through the 15-20 hour flights!! !